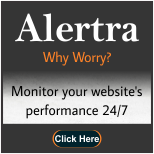 A website monitoring software is helpful to ensure that websites are always live and working. It also provides the users about the website performance and problem notification via beep sound, email or run a specific program if the website is unavailable, slow or down due to error messages. It monitors the website’s uptime, downtime, ping status with the support of major internet communication protocols such as HTTP, SMTP and alerts the users when the website is not active and goes down. The software detects the inaccessible websites, websites that do not load properly, respond very slow. Keeps you consistently aware of the website status and real time website performance. Helps e- business operations from the risk of failed internet transactions. Website monitoring software also monitors different server protocols, login pages, forms in a website. Some website monitoring software services are easy to setup. They do not need to install any additional software. You can add the website’s URL that are to be monitored and monitoring starts. Website-monitoring software provides awareness of real time website performance to ensure that transactions are always available and fully functional. They are flexible and alert the owner immediately in the event of any significant problem for the website.